Check back for next class date. 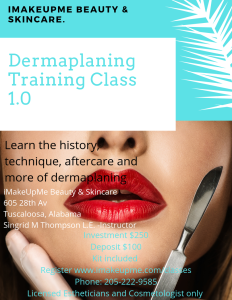 Dermaplaning 101- This class is a basic course that covers the history of dermaplaning, contraindications, safety, aftercare and more. It also includes a starter kit. Must be a licensed esthetician, cosmetologist or current student. This class is a basic, but detailed, “how to” class offered to those wanting to know how to properly apply their makeup. There is a 50% or more nonrefundable deposit required for all classes. 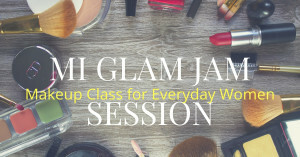 The Mi Glam Jam Class is scheduled by instructor only. All other classes may be booked at the convenience of the instructor and client. All Classes are taught on Sunday evenings. *Except special circumstances.